The new XMT 350 FieldPro system features Polarity Reversing - it automatically sets the correct polarity, lead outputs and weld parameters, saving time and money on the job site. Miller Electric Mfg. has introduced the new XMT 350 FieldPro system with Polarity Reversing. The system's technology eliminates the need to manually swap leads between welding processes — saving time and money and improving safety on the jobsite. "The more welders have to walk on the jobsite to make changes with outdated welding equipment, the more money it costs," says Ken Stanzel, product manager, Miller. 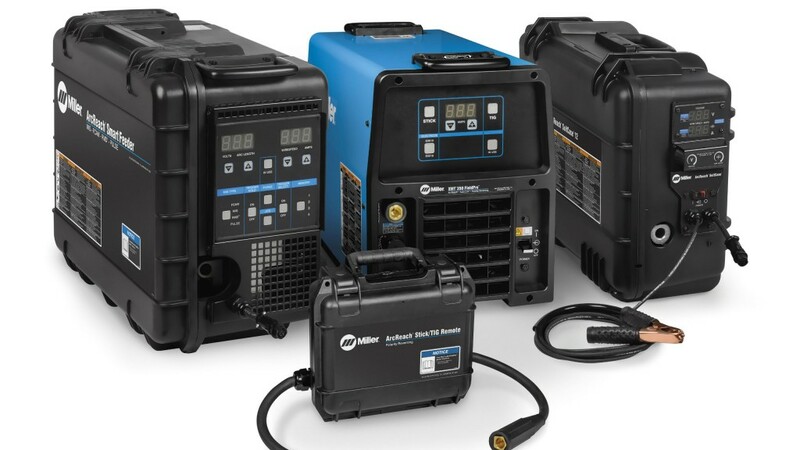 "The XMT 350 FieldPro system with Polarity Reversing eliminates the need to make these changes manually — making it ideal for any welding operation that swaps leads or cables to change welding processes." With the push of a button on the interface, Quick-Select technology automatically selects the correct polarity, lead outputs and weld parameters. This prevents operators from inadvertently welding in the wrong polarity, reducing the risk of weld rework that results from incorrect cable connection. Quick process changeover also eliminates the setup time spent switching cables and gas hoses. "There is no guessing and no need to check — welders get exactly the results they want," Stanzel says. "The interface is simplified and automatic, eliminating confusion and making it easy to train welders." The system's optimized stick and TIG arc performance is specifically designed for open root pipe welding — including process pipe and modular assembly applications — to help improve weld quality. Arc starts maintain the root opening and prepared edge, while stops limit arc marks outside the heat-affected zone. The XMT 350 FieldPro system with Polarity Reversing also includes Miller ArcReach welding technology, which gives welders complete control at the wire feeder or remote — even hundreds of feet from the power source. This minimizes the non-value-added time spent walking to and from the power source to make parameter adjustments and maximizes arc-on time, weld quality and jobsite safety. XMT 350 FieldPro power sources are compatible with all ArcReach accessories, which include multiple feeder and remote options, to help efficiently meet evolving project needs on the jobsite. The accessories provide maximum flexibility, delivering remote control capabilities for stick, MIG, TIG and flux-cored welding. TransCanada Corporation thanked U.S. President Donald Trump for affirming his support for the Keystone XL pipeline project by issuing a new Presidential Permit. Local mayors, First Nations, trades and business are applauding measures by the British Columbia government that will officially remove barriers and create a level playing field for the liquefied natural gas (LNG) industry and realize the opportunity for British Columbians to add value to our natural gas. This new industry will create thousands of new jobs, trades apprentices, contractor opportunities across B.C. and new revenue for local, provincial and federal governments. Cenovus Energy Inc. delivered strong operating performance in 2018 but took a financial hit in the process, the company reported in its year-end results release. While solid production continued across Cenovus operations, a $1.3 billion loss in the fourth quarter pushed it to a net loss of $2.9 million for the year. Pembina Pipeline Corporation has approved an additional expansion of its Peace Pipeline system, which will accommodate incremental customer demand in the Montney area by debottlenecking constraints, accessing downstream capacity, and further enhancing product segregation on the system. Phase VIII has an estimated capital cost of approximately $500 million and is supported by 10-year contracts with significant take-or-pay provisions. Phase VIII is anticipated to be placed into service in stages starting in 2020 through the first half of 2022, subject to regulatory and environmental approvals. Up to 75 percent of the under-construction Coastal GasLink pipeline could be sold by TransCanada after the company engaged RBC Capital Markets to manage the transaction recently. The National Energy Board (NEB) approved TransCanada's Keystone Pipeline GP Ltd. request to begin winter clearing work on the North Spread of its Keystone XL Project. The NEB has rejected a request by the City of Burnaby to rescind two Orders that authorize Trans Mountain Pipeline ULC to undertake pipeline relocations and decommissioning works at its Burnaby Terminal. The decision enables the company to continue its ongoing work to modify existing piping and related infrastructure within the facility. TransCanada Corporation has announced its intention to change its name to TC Energy to better reflect the scope of the company's operations as a leading North American energy infrastructure company. TransCanada's shareholders will be asked to approve a special resolution to change the name at the company's next Annual and Special Meeting of Shareholders. Prices for Canadian heavy and light oil should improve somewhat in 2019 because of increased demand from refineries in the United States, improving transportation capacity and mandatory productions cuts in Alberta, according to Deloitte's Resource Evaluation and Advisory (REA) group. In its latest report, Deloitte says these factors should begin to reduce the current oversupply of Canadian oil and help narrow the larger-than-usual differentials with WTI prices that were present in the final quarter of 2018. In the wake of Quebec Premier Francois Legault's recent statements about Alberta oil, which have sown discontent in Western Canada, a Leger poll conducted for the MEI shows that a large majority of Quebecers prefer to get oil from Western Canada than from anywhere else in the world. Tidewater Midstream and Infrastructure Ltd. has announced that TransAlta has exercised its option to acquire a 50 percent ownership interest in the Pioneer pipeline connecting the Tidewater owned Brazeau River Complex to TransAlta's generating units in the Keephills and Sundance area. Tidewater will construct and operate the 120 km natural gas pipeline, with an 11km lateral connecting to Sundance, which will have an initial throughput of 130 MMcf/d with the potential to expand to approximately 440 MMcf/d. The project is supported by a 15 year take or pay commitment from TransAlta. TransAlta's investment will be approximately $90 million. Construction of the 120km pipeline commenced last month and is expected to be fully operational by the second half of 2019. TransAlta's investment is subject to final regulatory approval of the lateral and licence transfers from Tidewater to the partnership. TransCanada Corporation has entered into an agreement to sell its Coolidge Generating Station to SWG Coolidge Holdings, LLC, a wholly owned subsidiary of Southwest Generation Operating Company, LLC, for approximately US$465 million (Cdn$623 million), subject to closing adjustments and customary regulatory approvals. Located in Coolidge, Arizona, the Coolidge Generating Station is a 575-megawatt natural gas-fired power facility that is underpinned by a long-term power purchase agreement (PPA). Cenovus Energy Inc. remains committed to increasing shareholder value through cost leadership, capital discipline and safe and reliable operations. These commitments, in combination with the company's high-quality upstream assets and joint ownership in strong refining assets, are expected to further strengthen Cenovus's ability to generate free funds flow and continue deleveraging its balance sheet in 2019. TransCanada Corporation has secured 675,000 gigajoules (GJ) (630 million cubic feet) per day of new natural gas transportation contracts from the Western Canadian Sedimentary Basin (WCSB) on TransCanada's Canadian Mainline. Its North Bay Junction Open Season resulted in long-term, fixed-priced contracts for service that will reach markets in Ontario, Quebec, the Maritimes and the Northeastern U.S.
As Western economies have struggled with the upheavals brought about by globalization, technological change, and disruption, one sector remained consistently strong for Canada: the energy industry. Put simply, Canada's economy cannot prosper without a growing and healthy resource sector. Algonquin Power & Utilities Corp. announced that its subsidiary Liberty Utilities (Canada) LP has entered into an agreement to purchase Enbridge Gas New Brunswick Limited Partnership , a subsidiary of Enbridge Inc., along with its general partner for C$331 million, subject to certain customary adjustments. New Brunswick Gas is a regulated utility that provides natural gas to approximately 12,000 customers in 12 communities across New Brunswick, and operates approximately 800 km of natural gas distribution pipeline. Inter Pipeline Ltd. has announced a $1.46 billion capital expenditure program for 2019. Approximately $1.34 billion, or 92 percent, of total capital expenditures will be for organic growth initiatives with the remaining invested in sustaining capital projects. CORTEC, a manufacturer of high-quality API valves and manifolds, has received a Safety Integrity Level (SIL) certification on its Model Series "CRV" Pressure Relief Valves and Model Series "D" and "LD" Trunnion Ball Valves, which verify the safety of the products. McIntosh Perry Consulting Engineers Ltd. (McIntosh Perry) has acquired Onstream Engineering Ltd. (Onstream), a leading provider of Engineering, Procurement and Construction Management (EPCM) Services in the Oil & Gas market in Alberta. The National Energy Board (NEB) is starting three weeks of Oral Traditional Evidence (OTE) proceedings as part of the Trans Mountain Expansion Project Reconsideration hearing pertaining to project-related marine shipping. SPX FLOW's GD Engineering brand has a long and successful history with the petrochemical and oil and gas industries. The Bandlock 2 closure is the original and benchmark design for high pressure closures. It ensures inside pressure cannot open the closure and has been proven to provide a safe, easy to use access solution with over 20,000 units in operation worldwide. Used in horizontal, vertical, inclined or declined installations for pipeline pig traps, filters, coalescers, strainers, separators, meter skid systems, hydrocyclones or any pressure vessel, even the largest of these closures can be opened in under one minute without the need for any special tools.